If you are making a donation to our team, first of all, you are all sorts of amazing and wonderful, and secondly, we need you to make sure to comment on your check memo or for the on-line donation -- in the comments section RESTRICTED TO PEDIATRIC CANCER RESEARCH. This will ensure that the money goes to funding only pediatric cancer research! THANKS! Lucy the Responder: Why do we call Lucy "the Responder"? Lucy's diagnosis of Infant ALL is rare. When she was first diagnosed we waited for additional lab results of her type of leukemia. If she had "regular" leukemia, she would have an 80% cure rate. If she had a genetic rearrangement (which makes up 80% of infant leukemia cases) that cure rate drops to 40%. We were devestated to hear she had the genetic rearrangement. Because of her age (almost 5 months) she was already high risk and would still endure a more intense treatment, but the prognosis was discouraging. The words that her oncologist spoke to us that day became our battle cry. She told us not to focus on the type of leukemia because if Lucy is "a responder" that is all that matters. From then on, we begged for paryers for Lucy to be a Responder, and so far, she has been! She achieved an early remission and has recovered well from her treatments. She is still in treatment today, but besides the bald head, you would never know! Nearly a year later, she is a busy 17 month old and keeps us on our toes! Amazingly, she hasn't missed a milestone yet! Her current obsession is climbing stairs, furniture...basically anything. She loves books and anything that her big sister is playing with at the moment. We started Lu Lunatics because we are CRAZY about Lucy and she is fighting leukemia like MAD! Our family has received countless acts of kindness and support this past year, and we want to celebrate how far we have come, and give back! We are beyond thrilled that Lucy is finally able to participate too - she has come so far! Jack's Story: The Pimmels - Joe, Kelly and big sister Molly - welcomed a sweet baby boy, Jack, on June 13th. Devastatingly, Jack was diagnosed with Acute Myeloid Leukemia (AML) type M7 on July 3rd when he was just twenty days old. Not only is infant leukemia extremely rare, but this type is one of the rarest and most aggressive with low survival rates. Jack fought so hard for his life, but in the end, the side effects from the chemotherapy were too much for his little body. He lost his battle on July 29th, 2014. We miss Jack everyday, and we have put this team together to celebrate Jack's life and continue to spread his story and raise awareness for infant leukemia. Join us on September 27th, where we will meet and walk together in Jack's memory and honor. Why we joined forces? Our goal is to ensure the fundraising efforts of family and friends goes completely to pediatric research. If our team can raise $10,000, we can designate 100% of our fundraising to a pediatric blood cancer research portfolio. Since this is a big number, we have decided to come together and work towards the same goal! By working together, we can raise the money needed and start raising awareness for pediatric cancer research! The Leukemia & Lymphoma Society's (LLS) mission is to cure leukemia, lymphoma, Hodgkin's disease and myeloma, and to improve the quality of life for patients and their families. In 2013, LLS invet $6M directly in pediatric blood cancer research. This represented 8.1% of their total research funding, a 30% increase compared to the previous year. LLS was also instrumental in gtting the Gabriela Miller Kids First Research Act enacted into law, which increases federal funding for pediatric medical research. To help us reach our goal of funding pediatric research, all donations must include a comment line that says “restricted to pediatric cancer research”. So a check should have that in the memo line and an on-line gift should have it in the comments section. 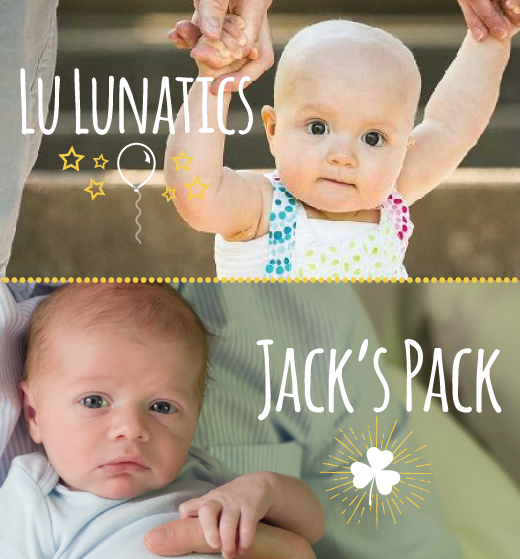 Join Lu Lunatics + Jack's Pack by scrolling to the bottom of the page and click the red JOIN button. (If you have already signed up to join the team via a sign-up sheet at the bone marrow drive, you have already been added to the team list.) Anyone can walk in the event and it is free to the public. However, walkers raising $100 or more become a Champion For Cures and will receive an illuminated lantern, t-shirt, refreshments and snacks. Walkers raising $25 will receive an illuminated lantern and refreshments. Illuminated lanterns are red for supporters, white for patients and survivors, and gold in memory of those who have passed away. What is Light the Night? Light The Night Walk is The Leukemia & Lymphoma Society's annual fundraising walk to pay tribute and bring hope to people battling cancer. Hundreds of thousands of participants raise funds for lifesaving research and patient services. Why Light the Night? To raise awareness and funds for the Luekemia and Lymphoma Society. Without your efforts LLS could not provide these lifesaving treatments. LLS really is making cures happen with your help. These efforts culminate in inspirational, memorable evening walks in over two hundred communities each fall across North America. LLS has invested $12.6 million over three years in research in Missouri, Illinois and Missouri. --provided information in 575 schools on cancer and volunteerism and supported children returning to school after treatment. You do not have to attend the walk, but you can help patients fighting this terrible disease by making a donation to LLS. The money will help fund these services in St. Louis. Please join our team's effort today by registering to walk or by making a donation. Your participation in the Light The Night Walk will save lives today. Be sure to check the Lu Lunatics + Jack Pack web site frequently to see our progress, and thanks for your support! Checks can be written out to The Leukemia & Lymphoma Society or LLS. Make sure to put "RESTRICTED TO PEDIATRIC CANCER RESEARCH" in the memo. "Your light shines bright little Jack, in all the hearts of those who loved you! Can't wait to celebrate your life on this special occasion! Love -The Selks"
"RESTRICTED TO PEDIATRIC CANCER RESEARCH"
"RESTRICTED FOR PEDIATRIC CANCER RESEARCH"
"RESTRICTED TO PEDIATRIC CANCER RESEARCH." "Donation restricted to pediatric cancer research"
"Wish I wasn?t so far away?would love to be part of your walk?will be there in spirit!! Aunt Ruth"
"RESTRICTED TO PEDIATRIC CANCER RESEARCH. " "This donation is for Pediatric Cancer Research"
"Love, Aunt Louise and Uncle Russ"
"RESTRICTED TO PEDIATRIC CANCER RESEARCH "
""RESTRICTED FOR PEDIATRIC CANCER RESEARCH""
"We love you all so much!!! We are heartbroken to miss it!!! Do it up BIG!!!" " RESTRICTED TO PEDIATRIC CANCER RESEARCH"
"RESTRICTED TO PEDIATRIC CANCER RSEARCH"
" For pediatric cancer research only. Thank you. " "RESTRICTED TO PEDIATRIC CANCER RESEARCH I wish we were not so far away and could walk beside you, Joe, Kelly and Molly, as you honor sweet Jack. Sending you so much love. Shannon"
"RESTRICTED TO PEDIATRIC CANCER RESEARCH in support of Jack's Pacl"
"restricted to pediatric cancer research Kelly - Your family and especially sweet Baby Jack have been in our thoughts and prayers. Your courage, strength and love for your family is truly inspiring. Delta Love, Amy "
"Pleae direct these funds to pediatric cancer research"
" RESTRICTED TO PEDIATRIC CANCER RESEARCH. " "God be with Lucy & her family along with the thousands of other affected families. God please help the many dedicated researchers find the cure for this horrible disease and allow our babies to grow to be normal healthy children. We ask this in the name of the Glorious Healer, Jesus, amen." "RESTRICTED TO PEDIATRIC CANCER RESEARCH Sorry we can't make it this year, but we'll be with you all in spirit!" "In loving memory of Jack Pimmel. *Restricted to Pediatric Research*"